name: "Namibia, Land of the Brave"
The economy is heavily dependent on the extraction and processing of minerals for export. Mining accounts for 11.5% of GDP, but provides more than 50% of foreign exchange earnings. Rich alluvial diamond deposits make Namibia a primary source for gem-quality diamonds. Marine diamond mining is becoming increasingly important as the terrestrial diamond supply has dwindled. Namibia is the world's fifth-largest producer of uranium. It also produces large quantities of zinc and is a smaller producer of gold and copper. The mining and quarrying sectors employ less than 2% of the population. Namibia normally imports about 50% of its cereal requirements; in drought years food shortages are a major problem in rural areas. A high per capita GDP, relative to the region, hides one of the world's most unequal income distributions. A five-year, Millennium Challenge Corporation Compact ended in September 2014. As an upper middle income country, Namibia is ineligible for a second Compact. The Namibian economy is closely linked to South Africa with the Namibian dollar pegged one-to-one to the South African rand. 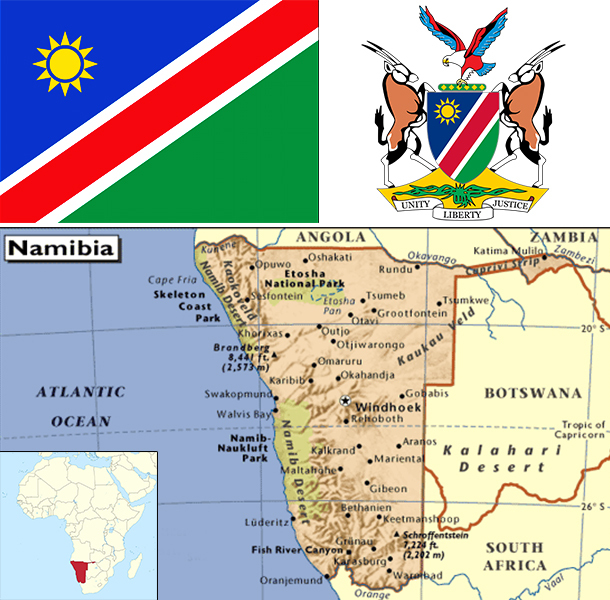 Namibia receives 30%-40% of its revenues from the Southern African Customs Union (SACU). Volatility in the size of Namibia's annual SACU allotment complicates budget planning. Namibia's economy remains vulnerable to world commodity price fluctuations, and drought. The rising cost of mining diamonds, increasingly from the sea, has reduced profit margins. Namibian authorities recognize these issues and have emphasized the need to increase higher value raw materials, manufacturing, and services, especially in the logistics and transportation sectors.